Evans and Columbia County are experiencing the excitement and the challenges of growth. In the center of this growth, the campus of the First Baptist Church of Evans stands at one of the county's main crossroads, at the corner of Washington Road and North Belair Road. The First Baptist Church of Evans has roots in the past, a strong life in the present, and a vision for the future. Our life and our ministry are centered on Jesus Christ and the abundant life he offers. Explore our website and find out more about us. Even better, join us for worship, or for a small group fellowship, or for one of our other ministries. We look forward to getting to know you. Helping people have abundant life in Jesus Christ. Bible Study for All Ages- 9:30 a.m. Prayer & Bible Study - 6:00 p.m. 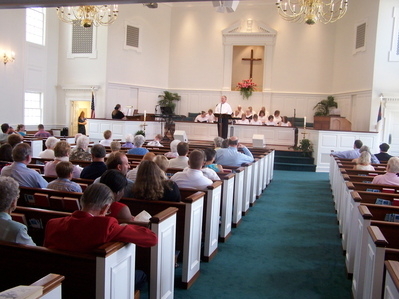 Sanctuary Choir Rehearsal - 7:30 p.m. Copyright 2019 First Baptist Church of Evans. All rights reserved.